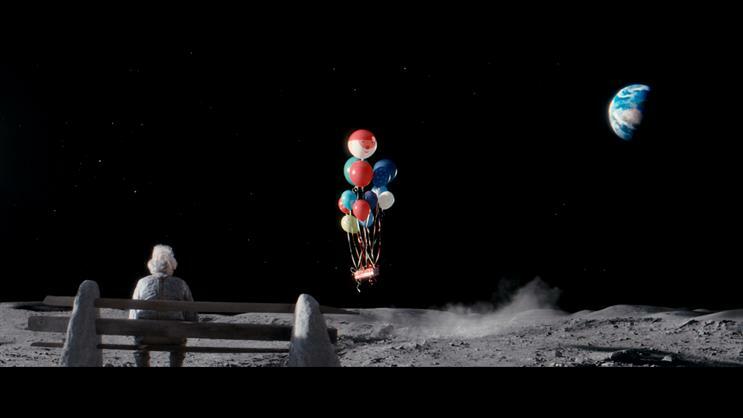 The John Lewis festive ad featuring a man on the moon is top of the chart for the second week running, whilst Aldi's spoof of the spot makes it to second place. A young girl notices a lonely old man on the moon and sets out to let him know that someone on earth is thinking about him by sending him a gift. The ad has been shared 116,142 times this week. The old man on the moon compares two telescopes, one from John Lewis and one from Aldi. He says he prefers the one from Aldi. When he looks through it he sees Jean Jones, the Aldi granny who starred in previous gin ads for the supermarket. Jones is on her way to the moon on an armchair attached to balloons. The ad has been shared 49,432 times this week. Judith Kerr, the renowned author, penned the story of Mog almost ruining Christmas day for the Thomas family. At the end the neighbours come together to make the day special. The ad has been shared 46,939 times this week. A young boy brings locals together to get them into the Christmas spirit. The ad has been shared 45,027 times this week. 5. Apple "Someday At Christmas"
Stevie Wonder and Andra Day perform Wonder’s Someday at Christmas. The ad was shared 21,443 times. 6. Porsche "taking the driving test in a sports car"
People are told they will be taking their driving test in a Porsche and struggle with how powerful the accelerator is. The ad has been shared 11,194 times this week. Campaign’s Pick of the Week, the Muppets star in the ad promoting the new giant crumpets from the brand. Kermit the Frog bursts into John Warburton’s office to pitch the idea, and then the ad shows the cast of the Muppets breaking out in song. The ad has been shared 8,863 times. The sports brand brought together fans of the Neo shoes range for a photo-shoot. The spot has been shared 20,086 times in the past seven days. 9. Porsche "Mark Webber gets off the track in a 911 GT3 Cup"
The former Formula 1 driver tries to drive around a track in a Porsche whilst trying to answer texts, he fails to stay on the track. At the end the copy reads: "Even the best can’t text and drive. That’s why you shouldn’t." The spot has been shared 7,213 times. A lady feels sorry for a small horse that feels lonely in a large field with other horses, so she orders a large cat flap so that the animal can use her house. The ad has been shared 6,864 times this week. The chart has been compiled by Unruly and does not include shares on Twitter.